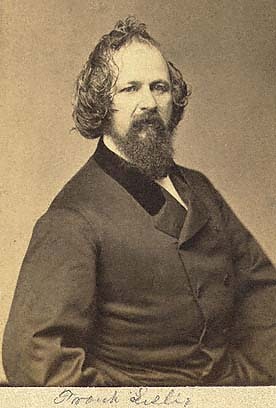 THE FRANK LESLIE EXCURSION TO THE PACIFIC. 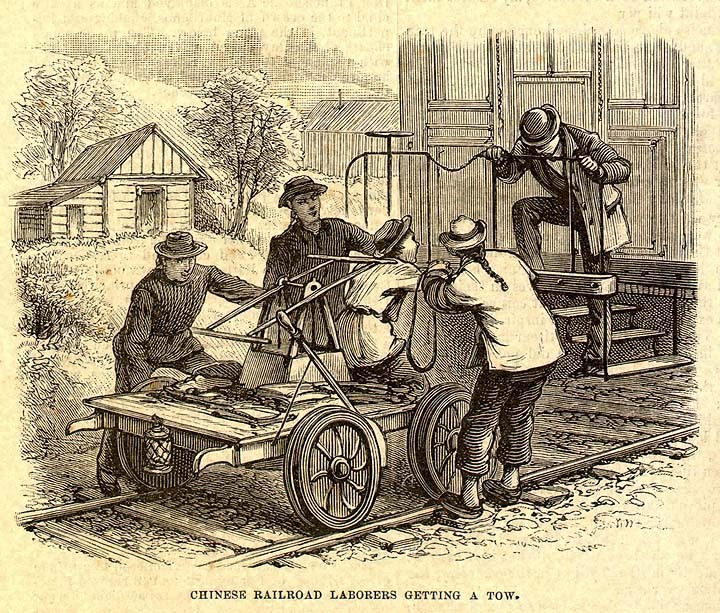 SIDE-SCENES ON THE CENTRAL PACIFIC RAILROAD. 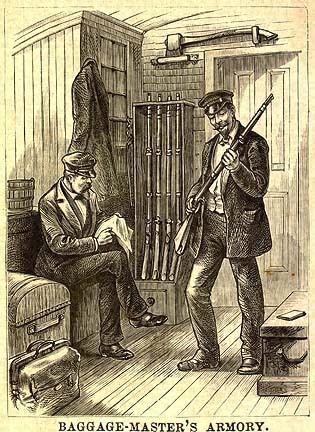 FROM our Pullman hotel-car, the last in the long train, to the way-car which follows closely on the engine, there is a vast discount in the scale of comfort, embracing as many steps as there are conveyances. It is worth one's while to make a tour of the train for the sake of observing these differences and noting the manners and customs of traveling humanity, when tired bodies and annoyed brains (there are plenty such even on the overland trip) have agreed to cast aside ceremony and the social amenities and appear in easy undress. The old assertion that man is at bottom a savage animal finds confirmation strong in a sleeping-car; and as for the women — even wider dear little five-and-three-quarter kids, the claws will out upon these occasions. For here, at 9 P.M., in the drawing-room steeper, we find a cheerful musical party bowling, "Hold the Fort!" around the parlor organ, which forms its central decoration; three strong, healthy children running races up and down the aisle, and scourging each other with their parents' shawl-straps ; a consumptive invalid, bent double in a paroxysm of coughing ; four parties, invisible, but palpable to the touch, wrestling in the agonies of the toilet behind the closely buttoned curtains of their sections, and trampling on the toes of passers-by as they struggle with opposing draperies; a mother engaged in personal combat (also behind the curtains) with her child in the upper berth, and two young lovers, dead to all the world exchanging public endearments in a remote corner. Who could bear these things with perfect equanimity? Who could accept with smiles the company of six adults at the combing and washing stages of one's toilet? Who could rise in the society, and under the close personal scrutiny of twenty-nine fellow-beings, jostle them in their seats all day, eat in their presence, take naps under their very eyes, lie down among them, and sleep — or try to sleep — within acute and agonized hearing of their faintest snores, without being ready to charge one's soul with twenty-nine distinct homicides? But if the "drawing-room sleeper" be a place of trial to fastidious nerves, what is left to say of the ordinary passenger-car, wherein the working-men and working-women — the miners, the gold-seekers, the trappers and hunters traveling from one station to another, and the queer backwoods folk who have left their log homesteads in Wisconsin and Michigan and Illinois to cross the trail of the sunset —— do congregate, and are all packed like sardines in a box? It is a pathetic thing to see their nightly contrivances and poor shifts at comfort ; the vain attempts to improvise out of their two or three feet of space a comfortable sleeping. Place for some sick girl or feeble old person, and the weary, endless labor of the mothers to pacify or amuse their fretted children. Here and there some fortunate party of two or three will have full sway over a whole section — two seats, that is to say — and there will be space for one of them to stretch his or her limbs in the horizontal posture and rest luxuriously ; but, for the most part, every seat has its occupant, by night as well as day, a congregation of aching spines and cramped limbs. The overland journey is no fairy tale to those who read it from a way car ! We climb into the baggage-car sometimes to admire the orderly-piles of trunks and valises andboxes, to peep at the queer little corner fitted up as an armory, with its gritted door and assemblage of deadly weapons held always in readiness for a possible attack upon that store-house of many treasures ; or we take a furtive glance at some pretty girl who has been seized with an unconquerable desire to explore her trunk, and who — under close surveillance of the baggage-master, who is no respecter of persons — is turning over the trays to rummage out a handkerchief or a clean collar, or perhaps a hat in place of the one which a gust of wind just now sent whirling over the Plains into some Pinto lodge. Among the "side-scene"sketches which our artists scratch down by the way, the Chinese roadmenders come in; we find a constant amusement in watching them along the route from Echo Cañon to Reno, where whole groups of them dot the roadside, bare-legged, ragged, dressed in a sort of hybrid mixture of Chinese and Caucasian styles, with their pig-tails twisted up out of the way, and their great straw platter hats tied under their chins. They are by no means the smooth, immaculate wellshaven pictures of neatness which greet our eyes in the dining-saloons — on the contrary, they are evidently of the lowest caste of Chinamen, with stupid, half-brutal faces, and dirty and unkempt though still, in these respects, falling far enough short of the Irish or German laborer. They work diligently as beavers along the route, traveling from point to point with their tools on a little hand-car, which they sometimes hitch fast to our train, and then we, on the rear platform, find an ever-fresh delight in looking down upon them, laughing, and pelting them with "pigeon English," to which they scorn a response, but sit cackling among themselves in their own queer chopped-up language, replete, probably, with opprobrious epithets for the "white devils." 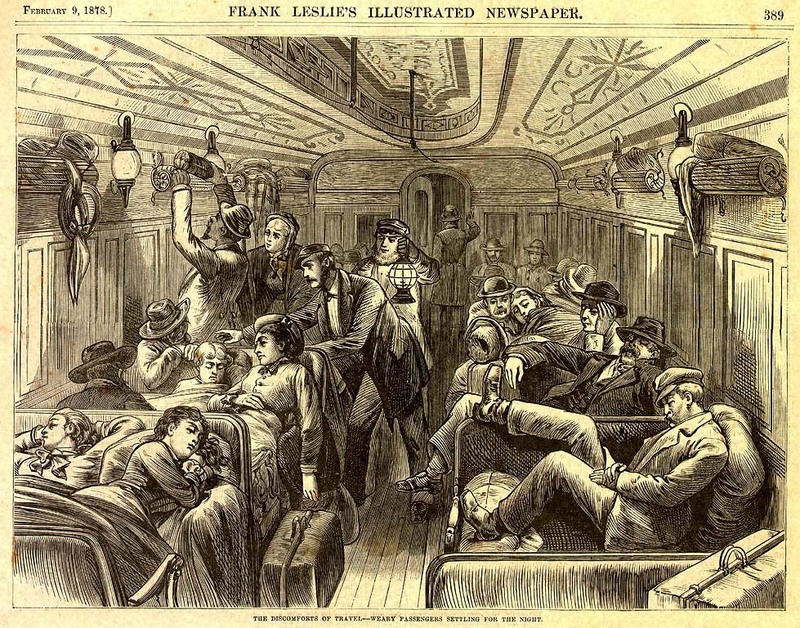 Note: The above is one complete article published February 9, 1878, in Frank Leslie's Illustrated Newspaper, from the July, 1877 - late 1878 multi-part series on "The Frank Leslie Excursion to the Pacific Coast." The vivid description of this transcontinental excursion on the Pacific Railroad by Frank Leslie and his wife, Miriam, captures the experience of travel on the CPRR as well as the regrettably commonplace prejudices of the 19th century. Frank Leslie's technological innovation, a dramatic speed-up in wood block engraving, made possible the illustrated newspaper, of which Frank Leslie's Illustrated Newspaper and Harper's Weekly were preeminent. Leslie realized that large wood block engravings could be prepared fast enough to appear in a weekly newspaper by drawing the entire image onto a single wood block, then cutting it into rows and columns of smaller blocks each of which could be simultaneously hand engraved by a separate engraver. He or She?... Frank Leslie - Illustrator; "The Belle of the Boardroom"
"The Transcontinental Tourist; The Writings and Travels of Miriam F. Leslie, 1877"
Reference: Reinhardt, Richard. Out West On the Overland Train. Across the Continent Excursion with Leslie's Magazine in 1877 and the Overland Trip in 1967. Palo Alto. American West Pub. Co. 1967. Also Castle Books, Secaucus, New Jersey. 1967.